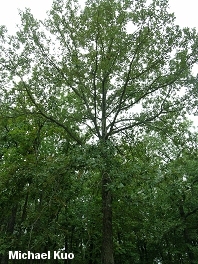 Leaves without bristle tips, with 5 lobes--2 of which usually form a broad cross with the central axis; acorns sweet, enclosed by cup about halfway; growing from Texas to Iowa to Pennsylvania. Habitat: Typically on well drained soil (on ridges, high ground, and so on), but often in moist areas as well; often growing with other oaks or with hickories; growing from Texas to Iowa to Pennsylvania. Stature: 40-60 feet high; to 2 feet in diameter; with a rounded crown; with a few large branches; shrub-like in very dry areas. Leaves: 4-6 inches long; usually with 5 rounded-off lobes, the top lobes forming a broad cross with the central axis; dark green and smooth on top, pale and finely hairy below. 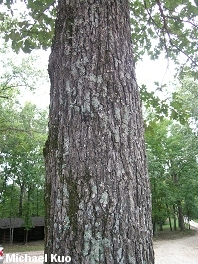 Bark: Grayish brown; furrowed (without the loose plates typical of White Oak). Acorns: Sweet; to 2/3 inch long; enclosed about 1/2 in a scaly cup.